A pair of classical treasures, Ballet Imperial and Suite en Blanc make a neatly balanced midyear complement to the streamlined modern dance of Chroma. With nary a trace of narrative or character, the dances celebrate the classical tradition in its purest form, leaving the audience to relax and take in the beauty. 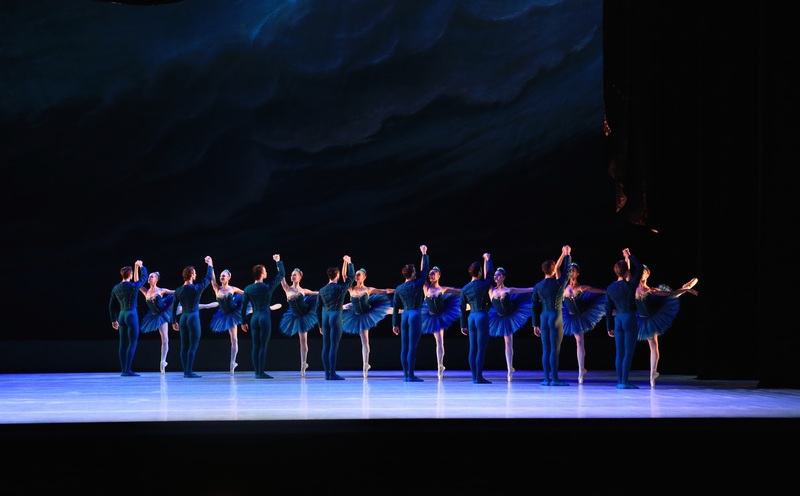 The regal tone of George Balanchine’s time-honoured Ballet Imperial is established with a majestic showcloth bearing a griffin-laden coat of arms that would not look out of place on Game of Thrones. 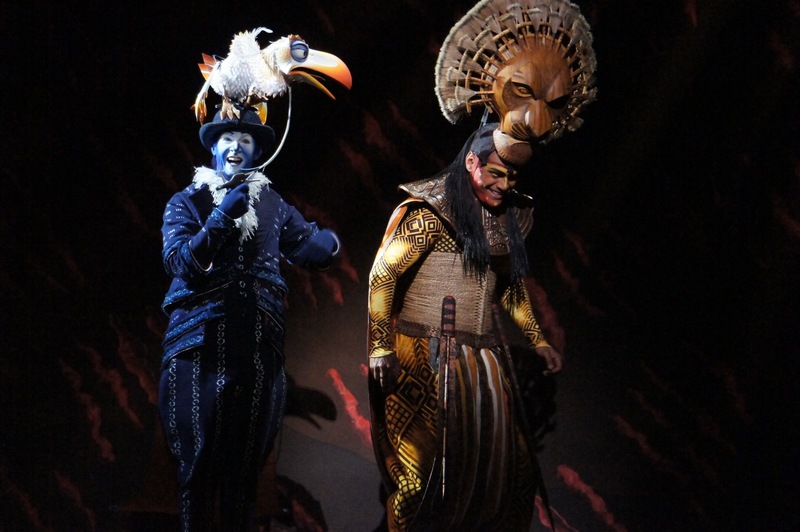 With a simple backdrop of storm clouds and bit of gold curtain overhead, Hugh Colman’s costumes are far more attractive than his basic set design. The lead dancers’ rich sapphire costumes stand out attractively against the sea of deep turquoise of the corps. Concerto No. 2 is reflected beautifully in Balanchine’s choreography, with extensive variations creating all kinds of symmetry balance. Young pianist Hoang Pham sends a forth a liquid cavalcade of notes on grand piano. His playing achieves a solid level of balance with the orchestra, creating a sound so rich that it is easy to miss whether piano or orchestra are playing. Adam Bull distinguishes himself as much from the strength and grace of his dancing as from his mature, highly focused stage presence. Achieving rather incredible speed in entrechat, Bull also creates a mighty impression with elegant leaps of such power that he seems to float momentarily in the air. Lana Jones is a graceful partner who maintains a placid smile even during the most demanding of moves. As a pair, Jones and Bull communicate in imperceptible shorthand that conveys trust and enhances their synchronicity. The gleam that shines forth from Miwako Kubota is not just due to the most sparkling of sapphire tutus, but from the way she beams with pleasure at the combined beauty of the music and dance, her enjoyment infectiously inspiring our own pleasure in the performance. Benedict Bemet and Ako Kondo are lovely soloists, whose radiant smiles complement the quality of their dancing. Brett Simon and Rudy Hawkes provide strong support in the true sense of the word, in that they contribute skillfully to the dance while maintaining a neutral stance so as not to draw attention from the featured dancers and the ensemble. Serge Lifar’s perennial favourite Suite en blanc remains a virtuosic display of dance. 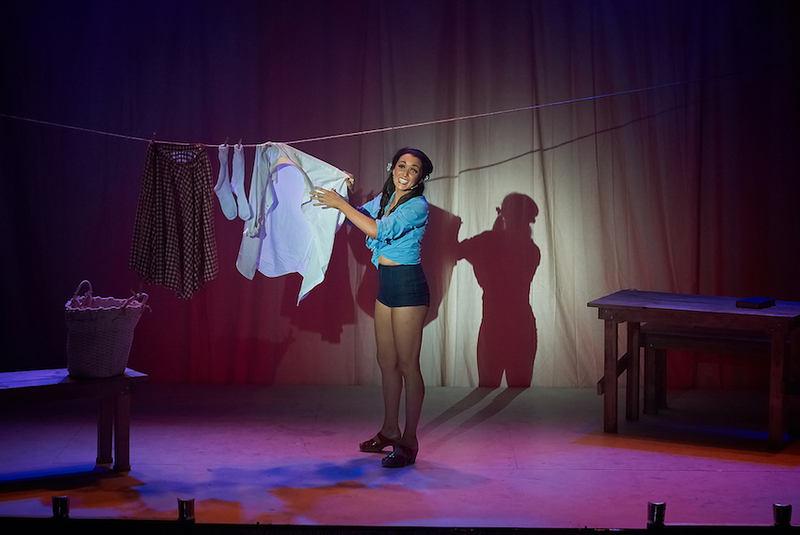 If taken as an indicator of the company’s current depth of talent, it gives a very healthy impression indeed, with each divertissement drawing rapturous, appreciative responses from the crowd. Eduard Lalo’s music begins with a hypnotic pulse before developing a splendid sense of pageantry as the piece proceeds. Maestro Nicolette Fraillon draws a shimmering performance from Orchestra Victoria. William Akers’ lighting, recreated by Graham Silver, creates variation and depth in the all white costumes, bathing the dancers in warm light downstage while casting a ghostlier white upstage. Beginning with the rather spectacular stage arrangement of the full company, which draws instant applause, Suite en blancpresents a varied collection of dances, each more wondrous than the last. 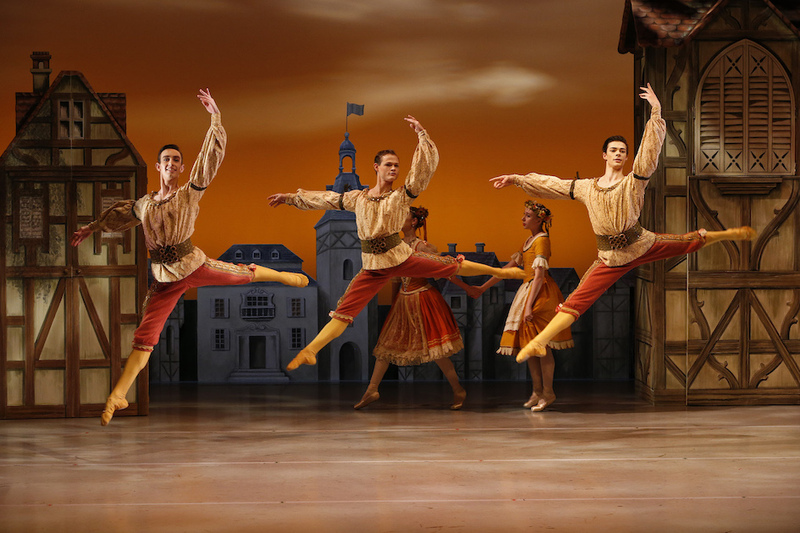 Highlights include Pas de Cinq, in which the serene Kondo is given terrifically masculine support from Brett Chynoweth, Marcus Morelli, Luke Marchant and Jacob Sofer. Pas de Trois illuminates the highly polished flair and control of principal artists Madeleine Eastoe, Kevin Jackson and Andrew Killian. Chengwu Guo’s supreme athleticism results in a jaw-dropping display of speed and elegance in Mazurka. 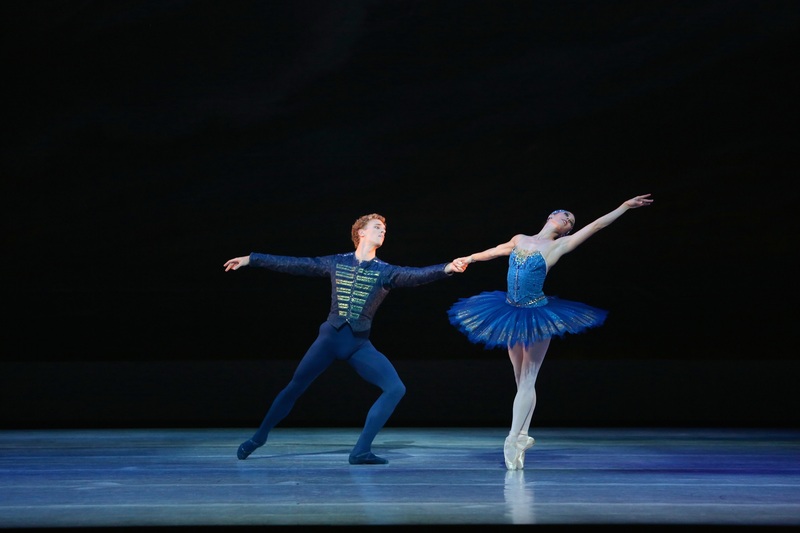 Amber Scott and Hawkes make the central Pas de Deux as dreamily romantic as that from a full-length story ballet. The final moments see a brief snippet from each section in quick succession, leaving the audience gasping in appreciative wonder. Ballet fans who usually only favour story ballets will delight at the abundance of classical dance on display here. No lover of tutus should miss Imperial Suite. 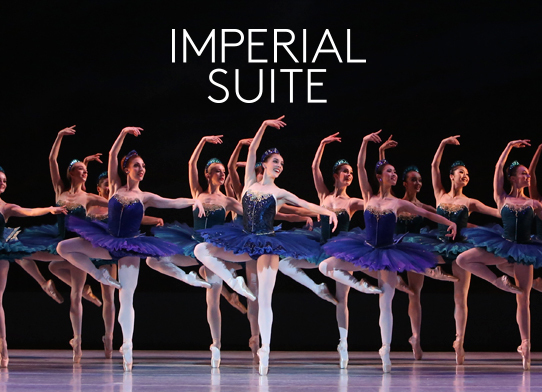 Imperial Suite plays at State Theatre, Arts Centre Melbourne, until 28 June 2014.